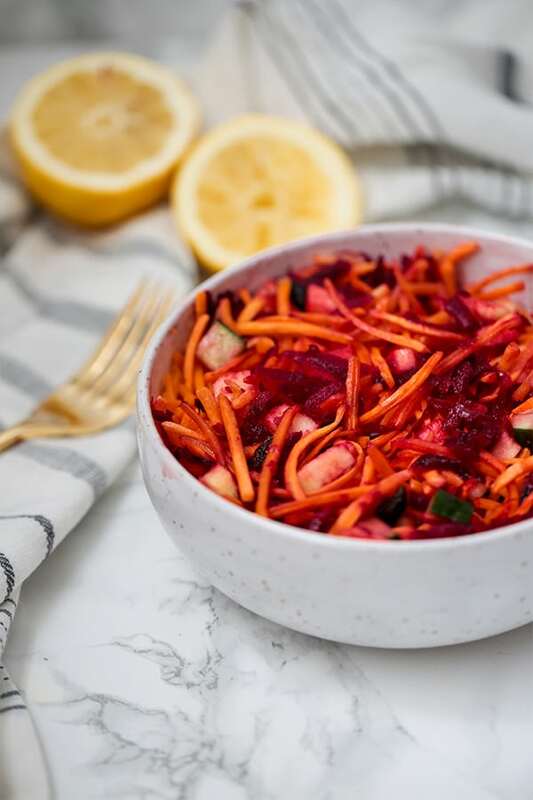 This detox carrot slaw is an amazing way to support your bodies natural detox pathways! It’s made with real food ingredients and is a simple side dish to enjoy. Detox has turned into such a spammy word. When we hear it, we think about detox tea, detox pills, radical cleanses, and just straight up unsafe practices. I’m always iffy about using the word in a recipe in fear that I’ll sound spammy too. However, supporting your natural detox pathways is possible with real, healthy foods like this recipe! So, what have we got wrong about detox? Why does it sound so spammy? Just like our body breathes, blinks, and digests without us putting any extra thought into it, it also handles detoxification. It detoxes things like old hormones, dead skin cells, toxins, and more. Every time we go to the bathroom, sweat, or even sleep, we’re detoxing! I can not count the amount of meme’s that I have seen that talk about your liver already doing all of the detox work, so all other efforts are useless. I have no idea why in the world people think that it’s impossible for their liver to be burdened and detoxification process to become impaired. We admit that we can have sluggish digestion, a slow metabolism, and a whole host of other problems, but these meme’s claim that the liver is just immune to all of that. News flash… that’s so wrong. We can support our detoxification process naturally! Just like you can support healthy digestion, healthy metabolism, and healthy sleep, you can support healthy detoxification! What are some of the ways you can do this? One of the most common ways that women add in extra toxins that burden their detoxification is with the products they use daily. Conventional makeup and skincare are loaded with dyes, heavy metals, and toxins that burden our system. That why I love being a part of Beautycounter so much! Beautycounter is safer skincare and makeup that leaves out the junk that burdens your detox pathways and is still high performing. I’ve loved switching over the beautycounter! Our liver has over 500 jobs, and blood sugar regulation is a big one. You can support your liver by making sure your diet is balanced and lower in sugar to regulate your blood sugar. Elimination is one of the biggest ways we detox! Support healthy digestion for better detox and colon health. Again, another huge way that we detox. Moving our lymph and sweating is another great way to detox. 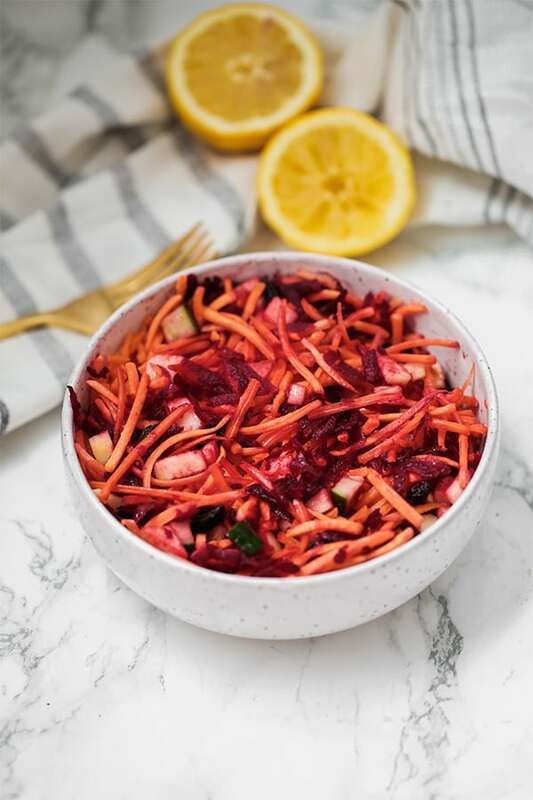 Certain foods do help support the detox process, and this carrot slaw is packed with them! Examine potential heavy metal exposure. Way more people deal with this than they realize… myself included. You can read about my journey with mercury detox here. Work 1:1 with a doctor. This is SO important if you have long-standing detox and health issues. Everything listed here is generally good advice, but working one on one with a doctor to determine exactly what your detox pathways are doing is the only way to really address this effectively. I have a blog post on finding a good doctor here. Carrots are loaded with fiber and specifically help to detox estrogen, which is a huge burden for many women with endocrine issues, autoimmunity, and hormone imbalance. This is NOT a spammy detox recipe that you eat exclusively for 5 days and lose 5 lbs. This is a yummy side dish that you can serve as a side or a snack when you’re wanting to give your liver a little love and get some extra veggies… that’s it! No gimmicks, just healthy food! Combine all of the veggies and fruits in a large bowl and mix. Prepare the dressing by whisking together olive oil and lemon juice. Pour the dressing over the veggie slaw and mix to evenly coat. Chill for 15-25 minutes. Serve chilled and enjoy! You can just omit them and add more carrots. I’m not a big salad eater but for some reason this salad was for appealing. I made it tonight and it was wonderful! I never knew I liked raw beets. Thanks for a great recipe. I look forward to trying more of your recipes. What kind of beets? Cooked or uncooked? I’m not a salad eater but I LOVE this one. I’ve already made it several times. I’d never even bought beets before and they’re great raw. Thank you!! !